You would have read many jokes and funny stories but the story written recently by secret agencies of India had no alternative. This is the story of a sudden confession of an extremist Hindu after four years of destruction of Samjhota Express. The district Dangs of Indian State Gujarat’s leader of Wanami Kalyan Aasharm, Swami Aseemnand was arrested by Indian police on 19th November 2010. after one and a half month of arrest on 4 January 2011 when he was silently presented in front of Magistrate, after remaining two days in judicial custody he not only confessed that he destroyed Samjhota Express but also told names of others who were involved in destruction of train as well as bomb blasts in Malegaon, Jaipur, Dakan and Ajmer Sharif. His important colleagues are Andresh Kumar, Ram Jee, Sandeep Dange, Devandra Gupta, Lakosh Sharma, Togi Aditte Nath and Sanil Joshi. How ever Sanil Joshi died suspiciously. According to Swami hi was responsible for installation of explosives. When Magistrate asked that whether he is confessing due to Police torture or pressure he replied, “I am confessing after getting impressed by the good treatment of a Muslim. Police daily tortured him and I felt sorry for him. That Muslim prisoner was very good; he cared for me and shared his food with me. His behavior became a burden over my sub-conscious. after meeting him I realized that followers of Islam are very good persons and I have played with their lives without any reason. The second purpose behind destruction of Smjhauta Express was to defame Pakistan and ISI”. No one asked Swami that if he has been so much impressed from that Muslim he is neither afraid of his death and of his friends involved in these crimes than why he does not convert to Islam? Moreover where is such a prison in India where along with torture plenty of food is provided to Muslims that they can share it with other prisoners? Was Police forcing Swami to fast (not giving anything to eat)? But who raise these questions? Because all of this information had been released by Delhi Police in a press conference on 6th January to Indian media. As soon as the confession of Swami published in Indian newspapers, our rulers also got reminded that in Samjhota Express 42 Pakistani passengers died and many were injured. While Lashkar-e-Taiba, Jaish-e-Muhammad and ISI was blamed for these blasts. Govt. Pakistan demanded the details of the investigations but Indian govt. replied nothing can be shared with Pakistan about investigations. On this govt. of Pakistan should have postponed any co-operation in investigations of Mumbai attacks and had demanded that Pakistani team should be allowed to investigate Samjhota Express tragedy. Pakistan should also have brought Colonel Purohit and on duty officers of Indian army involved in these bomb blasts on record because Swami has not named them in his confession while they were arrested after 6 months of this terrorist incident by ATS Maharashtar along with evidence against them and are still under custody of Police. 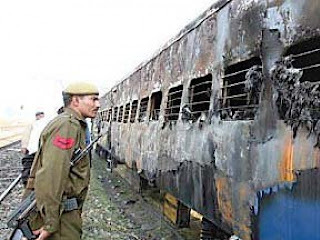 In this new situation Indian officials confess that Hindu Extremists used Improvised Explosive Devices (IED’s), due to which two bogies got destroyed by fire however detonators in other bogies could not activate otherwise all bogies would have been destroyed. 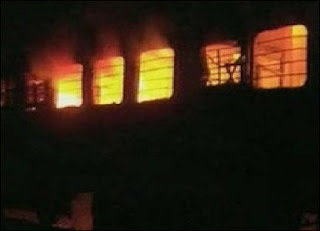 Indian investigation institutions are still saying that the cause of fire in bogies was kerosene oil installed with bombs. According to them the kerosene oil was filled into plastic bottles, these bottles were put into luggage bags which were put in seven bogies on different places. Is kerosene oil capable of spreading fire in such a way that 2 bogies are burnt to ashes just within movements? Indian investigation authorities are lying and confession of Swami is also a plan to change the investigations, we will discuss this aspect later. First I would like to include an article with the title of “Mahasbhai Suicide Bomber and Chemical Used in Samjhota Express Tragedy” and few questions raised in this article and some concerns expressed in it. This article was published after 7 days of the Samjhota Express incident on 25th February 2007 in the Daily Nawa-i-Waqt. Here it is important to restate this article so that Indian game can be easily understood. Why the security or immigration requirements have not been fulfilled while passengers were getting in to the train? Why the passengers of adjacent bogies have not heard the blasts? If the blasts have happened into the destroyed bogies why are there no sign of blast impact on floor and roof of bogies? Was there actually kerosene oil in the luugage bags and plastic bottles or something else which burnt two bogies to ashes within 15 minutes? This could have been “Liquid Oxygen” which is capable of burning things within the thousandth part of a second. Will Indian govt. provide the solution or chemical to Pakistan for testing? According to previous record of terrorism Indian investigation institutes waste months on investigations but they cannot reach to any decision, but in case of Samjhota Express how they prepared sketches of two suspects within few hours with the help of eye witnesses? 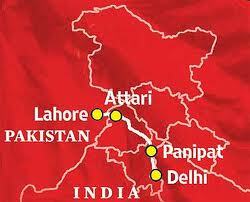 Why India is not providing lists of the passengers traveling through Samjhota Express to Pakistan? Why Indian Foreign, Interior and Railways Ministries are showing irresponsibility in spite of being ashamed on the murder of dozens of innocents? The passengers visiting India are witness that how much they are investigated and according to some reports their luggage is also scanned by special X-ray machines. Dozens of armed Police men are always on the watch around the platform, then how is this possible that Indian govt. has removed all security barriers while Shiv Sina had already been involved in firing over Samjhota Express during Nawaz Sharif reign, in which many Pakistani passengers were injured? Are the secret agencies of India involved in this terrorist activity in Samjhota Express? If this argument is false then accusing Jash-e-Muhammad and Lashkar-e-Taiba is not without any reason. In order to support and provide further evidence to its accuses over these two groups India can stage a big drama of terrorism in near future. So that it could be proved that behind all terrorists activities there are Pakistani religious extremists. Keeping in view the above concerns think over the present situation. Pakistani govt. wants the details of investigations conducted by Indian govt. The information that is going to world is only that which Indian govt. is allowing i.e. the group of Hindu Extremists have been arrested and brought in front in court. The central culprit has confessed. The more shocking aspect is that from RSS to Bajrang Dal in India all are silent, even BJP has not reacted to it. The persons who keep on eye on the Indian politics should must have been aware that all the accused who have been brought forward in case of Samjhota Express belong to “Abhinav Bharat”. This is a organization of Hindu Nationalists registered in Maharashtar. It is also known as sub-organization of Indian BJP. Without this organization BJP has no presence in Maharashtar, Gujrat, and other provinces. Although these arrests have been made under “criminal procedure” however in order to save actual culprits of Samjhota Express these arrests will be molded as political arrests. This is the reason behind the silence of Hindu Extremists.